Holbrook Village Hostel is a 21 bed facility divided into 3 houses with seven rooms in each unit. The hostel underwent a substantial renovation in 2016 and is now a modern and elegant facility. 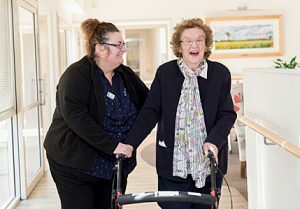 The facility is surrounded by landscaped gardens with walking paths which are perfect for a morning stroll, or to just sit in the gardens and relax and enjoy a cuppa. Residents enjoy a five day activity plan organised by the wonderful Care Staff and Volunteers. All rooms are large single rooms with an en-suite. We encourage each resident to personalise their rooms with touches from home. All meals are home cooked and served in the lovely dining area which adds to the homely atmosphere of the facility. Refundable Accommodation Deposit (RAD): – this is commonly referred to as the “bond” and is determined by Centrelink and based on the assessment of your income and assets. The full RAD for Holbrook Hostel is $260,000. 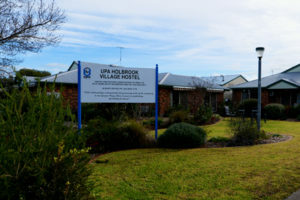 Holbrook Village Hostel is part of the Riverina Murray Region of the United Protestant Association of New South Wales. 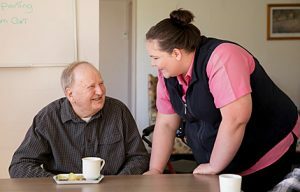 A not-for-profit provider of aged care services, operating five retirement villages, six residential aged care facilities and providing aged care support services across Southern NSW and the Border.